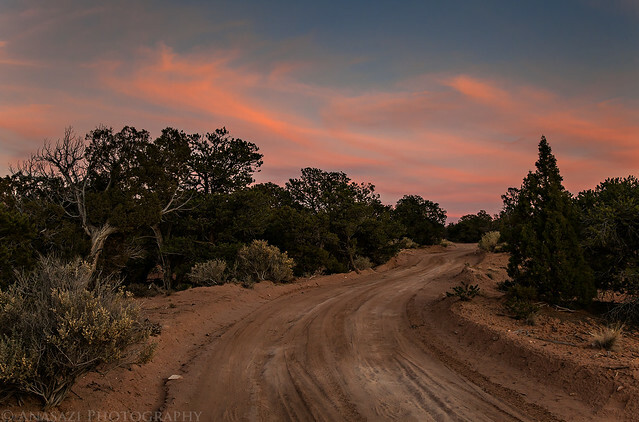 After work on Thursday evening I got in my Jeep and drove into Utah again. I had taken Friday off from work and was planning on meeting a group of friends in Beef Basin for a long weekend of camping and exploring the area. 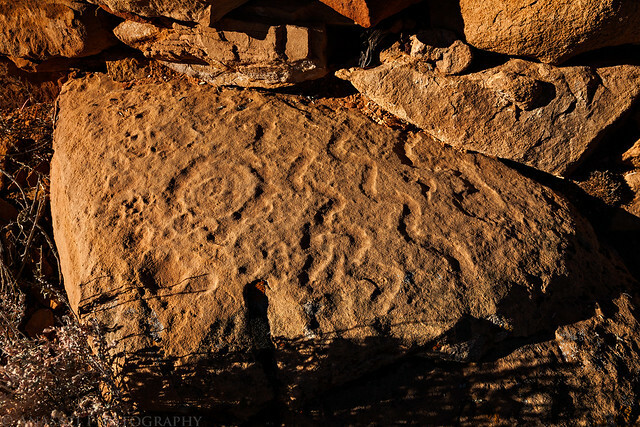 A few months earlier my friend Rob had tipped me off about a large petroglyph panel in the area he knew I would be interested in finding, and that was the beginning of planning for this trip. I arrived at our predetermined campsite in the dark and found Marty already there with his tent setup and a campfire already going. I was surprised to only be the second person there but knew the others would arrive shortly. Twenty minutes later Alex, Rob and his companions showed up. We sat around the fire for a little while waiting for the others, but headed to bed before anyone else arrived since we planned an early start for the following day. As soon as we were in our sleeping bags Jared and his brother Brian showed up. Later that night I heard Dave and his son pull up in their Jeep. We had all made it. 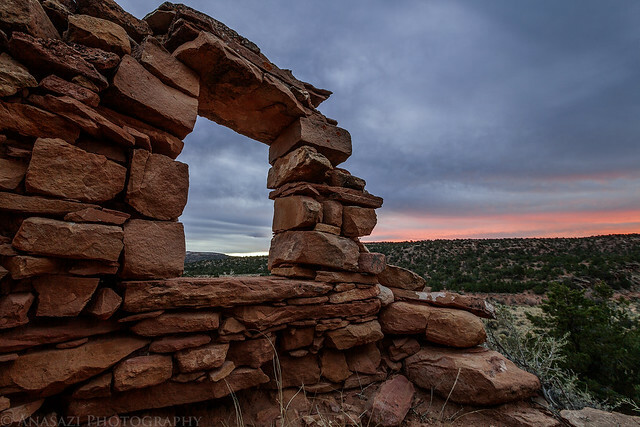 Friday morning I was up early and it looked like there might be a good sunrise, so I got in my Jeep to find a place to take some photos and ended up at a nearby ruin. I was hoping the sky would light up with color, but only the horizon turned a little pink. After returning to camp and waiting for everyone else to finish getting ready we got in our vehicles and drove over to the Fable Valley Trailhead. 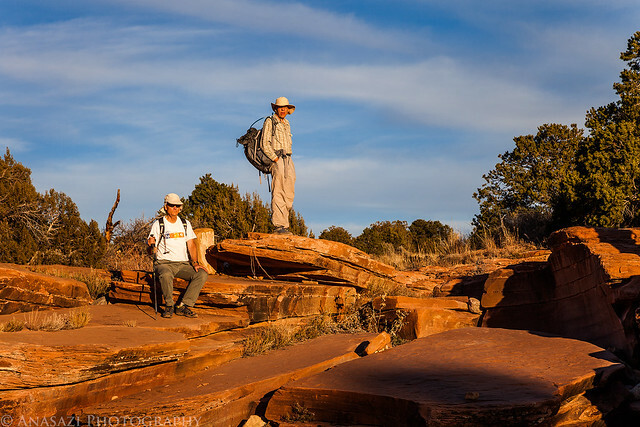 We were planning on exploring Gypsum Canyon following a route that Rob had planned out. 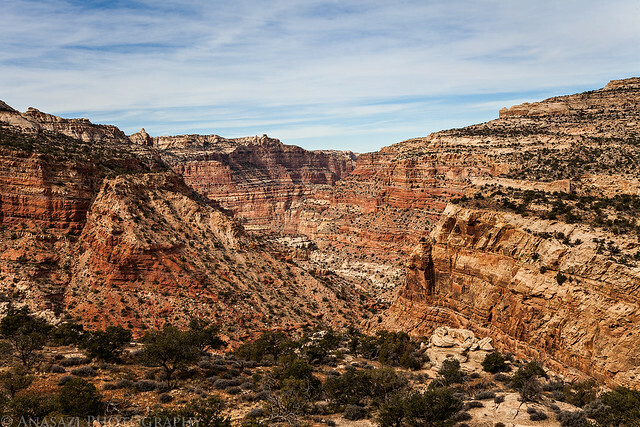 We started out hiking along an old closed road that followed the rim of the canyon. 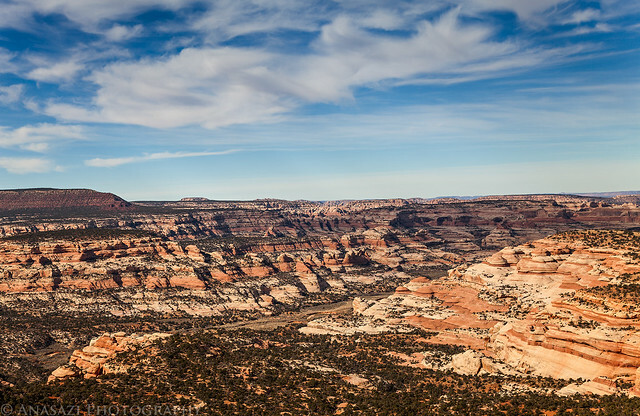 This is looking back at the confluence of the two upper forks of Gypsum Canyon. 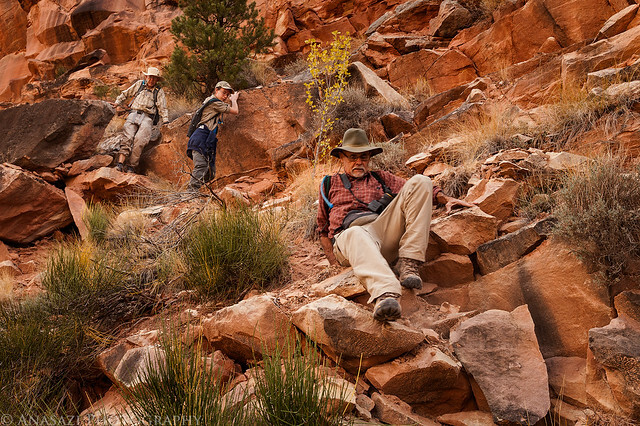 Once the old road ended we were left scrambling and route-finding our way along the rim of the canyon and then across a small side canyon. Looking down the canyon towards the confluence with Fable Valley from the rock we stopped at for a lunch break. We were looking for a way down into Gypsum Canyon at this point and thought we had found a way in. We even found a cairn that gave us hope of a way down. Things started off easy, but soon things got much steeper and loose. Most of us finished the descent into the canyon sliding down a very steep and loose talus slope that offered us no way back up to the rim of the canyon. In other words, we had to find a different way out. Here’s Marty climbing down into the canyon when things started getting steep. 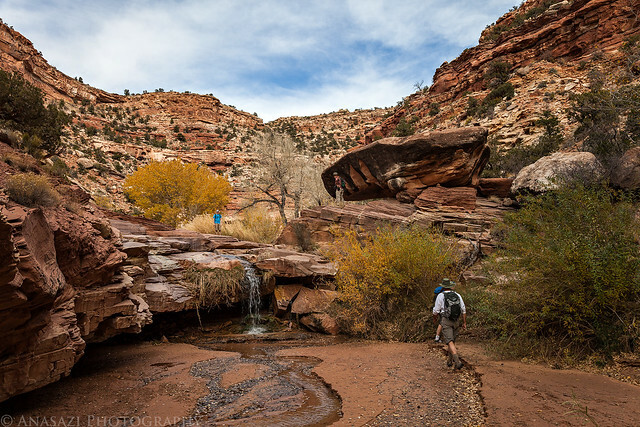 Once at the bottom, we started hiking upstream with hopes of finding an exit near the confluence of the two forks near the head of the canyon. 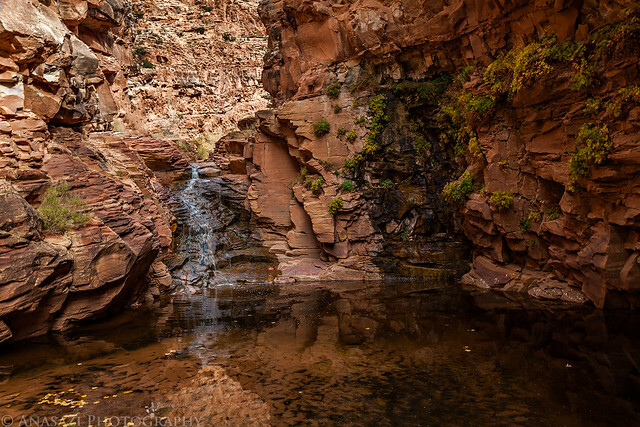 What we found at the bottom was a beautiful canyon with a flowing stream and plenty of waterfalls. Of course, a few of those waterfalls gave us some trouble as we tried to hike upstream. This is the first waterfall we came across, and also the first obstacle. Rob easily found a way to climb up next to the waterfall. While it was easy for him and almost everyone else in our group, I was not very comfortable on this section. I tried to find an alternate way around but was unable to. With the help of our group I was able to climb up the left side of the waterfall. 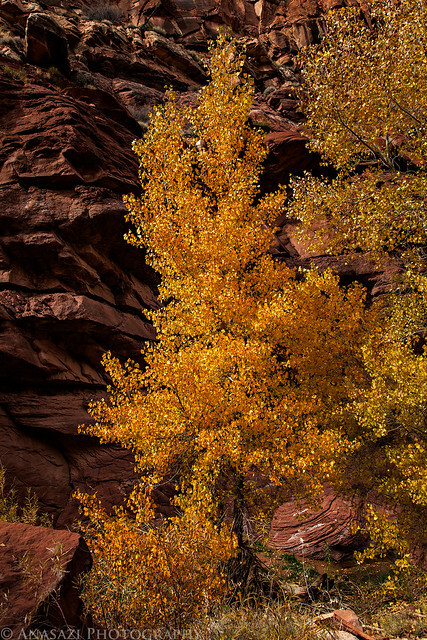 As we continued upstream we were treated to some remaining fall colors in the canyon. A little further up the canyon we entered this nice narrow section. 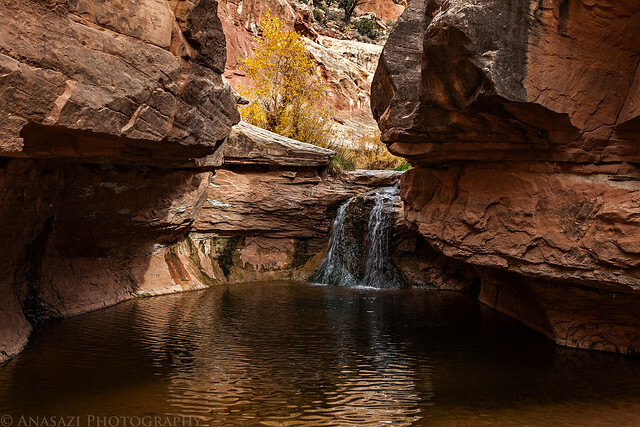 Of course, these narrows led us right to a nice plunge pool with another waterfall that we would have to bypass. 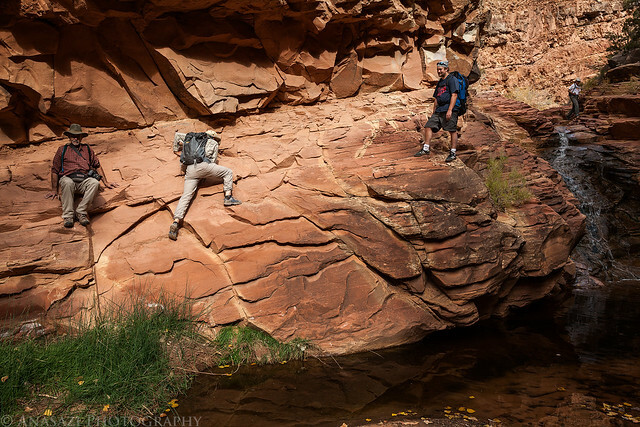 Luckily, we were able to backtrack out of the narrows and found a way up and around. Had the weather been warmer, this would’ve made a great swimming hole. Another small waterfall we encountered. This one was easily bypassed. There must have been a dozen different waterfalls along the way. Soon we could see the confluence of the two forks ahead, but right before reaching them we found ourselves stopped by another large waterfall, and this time we didn’t easily find a way up. After hiking back down canyon Alex found a route up that would allow us to bypass this last waterfall. I wasn’t so sure I’d be able to climb up here, but with everyone’s help I was able to make it. 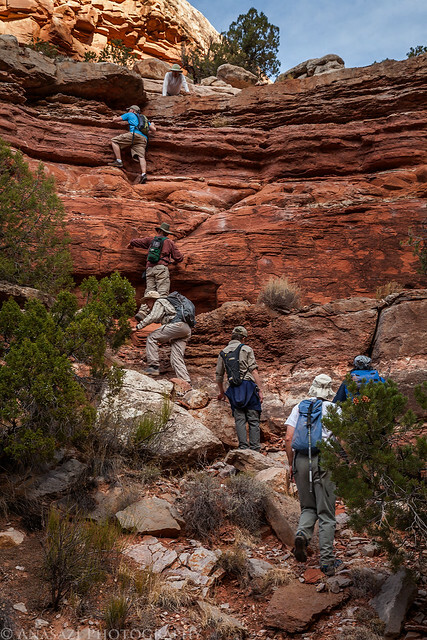 Once we reached the confluence we started our climb up to hopefully find a way out of the canyon. We followed Rob to the notch he thought we could exit out of, but it didn’t lead out. We were stopped about 20 feet below the rim of the canyon. We continued hiking along to see if there would be a way out. Eventually Dave found a way out but it involved some heavy bushwhacking and more climbing and chimneying, something I had not really done before. Thanks to the teamwork of our group we were all able to get out of the canyon at this point. The sun was getting low in the sky by the rim we reached the rim of the canyon again. 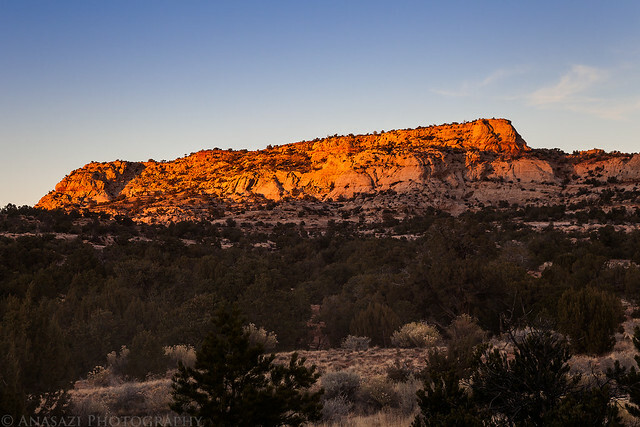 After driving back to camp the last sunlight of the day was striking this nearby butte. 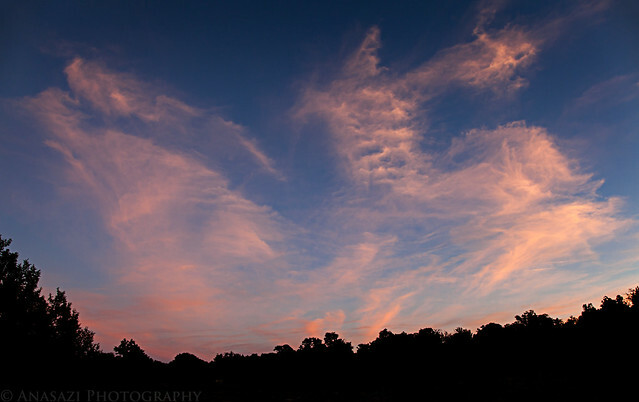 The clouds turned a nice pink at sunset this evening, too. We had some dinner, talked around the campfire and then got to bed. It had been a long and tough day for a lot of us and we were all pretty tired. The following morning we started out the day by hiking to a few ruin sites not far from our campsite. 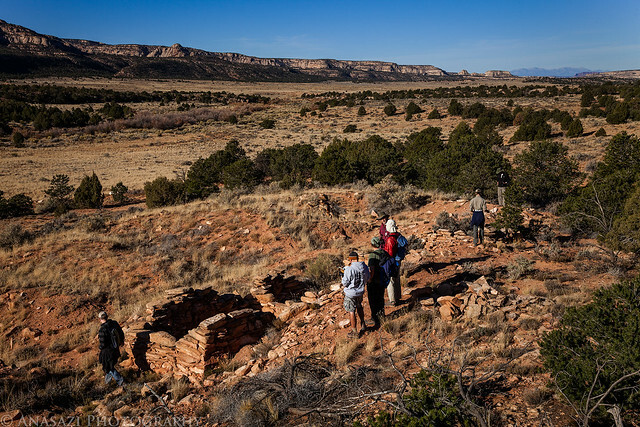 Our first stop was at a location known as L-House because the layout of the rooms are shaped like the letter L.
Jared and Rob study the map of the site from the excavation report. This site was excavated in the past and then back-filled again afterwords. There’s only a few walls still standing, but you can still make out the original floor plan from the remaining foundation stones. 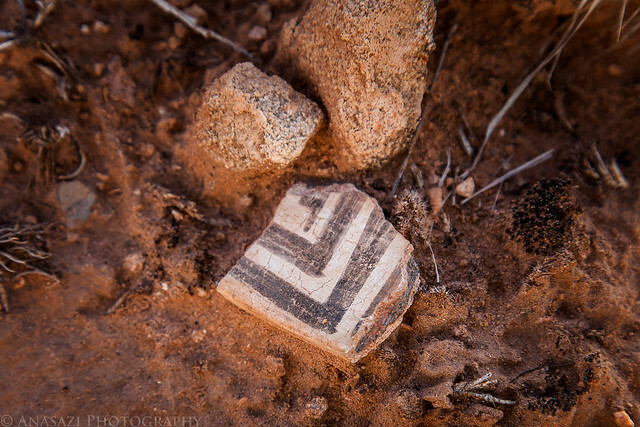 While most of the artifacts were removed during the excavation there were still a few potsherds laying around, if you looked hard enough for them. 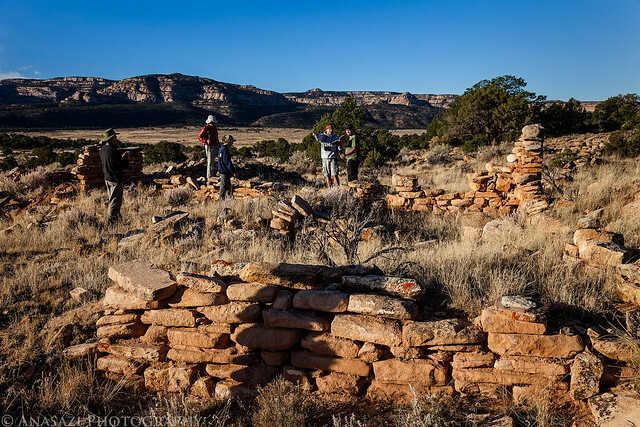 From the L-House we hiked over to another set of ruins known as the Ridge Site. 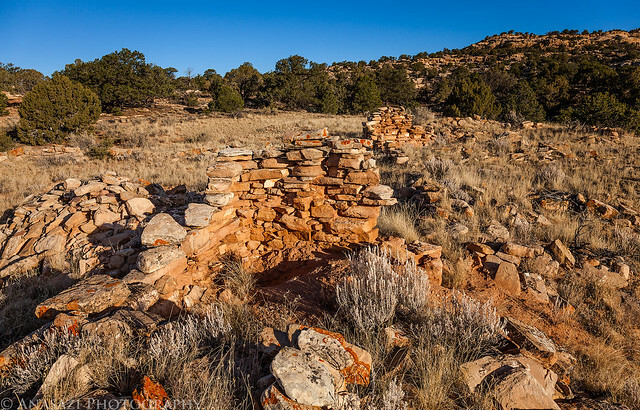 Like many of the ruins found out in the open in Beef Basin, there wasn’t much still standing. 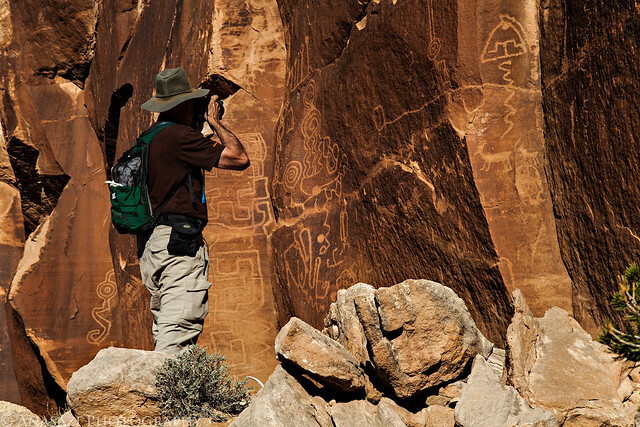 After our morning hike near camp we set off to search for the large petroglyph panel I hoped to find this weekend. We ended up hiking a few area where we thought we might find it, but came up empty handed. 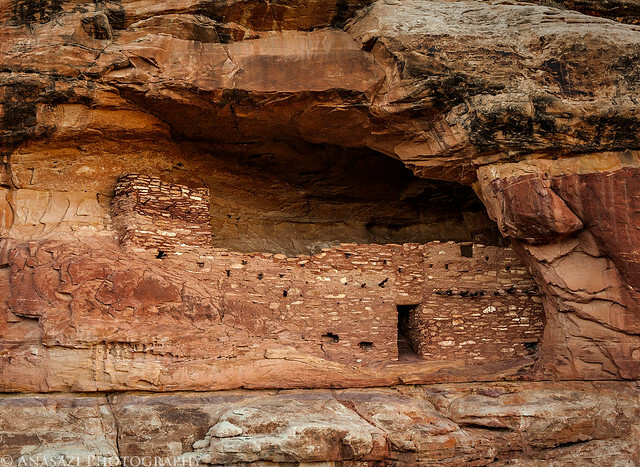 We did manage to find a few new ruins in our search, though. 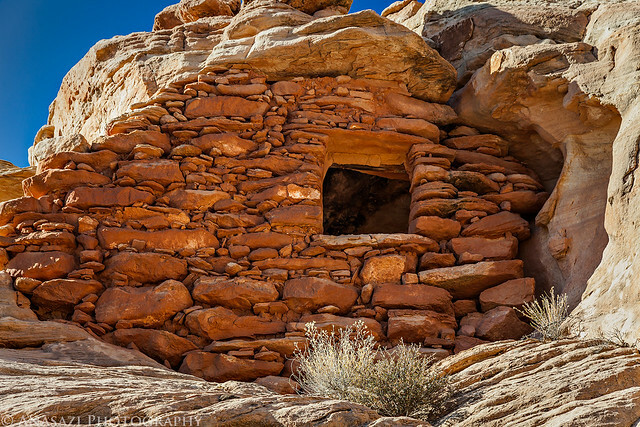 Marty spotted this single room ruin while we were searching for the petroglyph panel. While checking out the ruin above, we also spotted this hidden ruin nearby. Before heading back to camp Marty and I did a little exploring on our own. 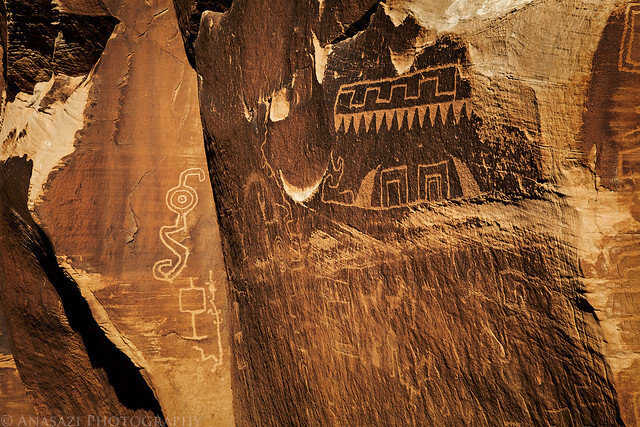 I started out by getting a photo of these faint petroglyphs I had missed before. 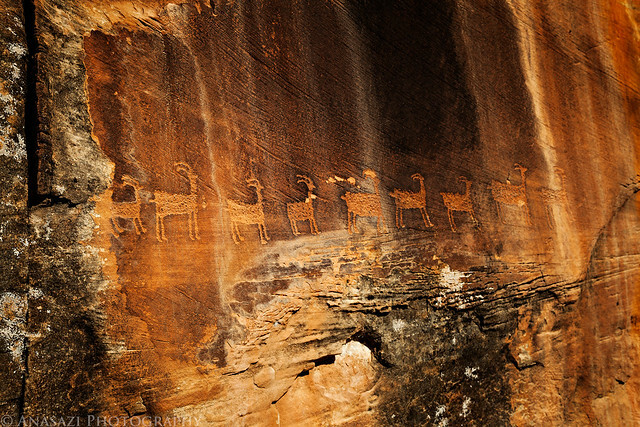 This is actually the very first rock art I have found in the Beef Basin area. 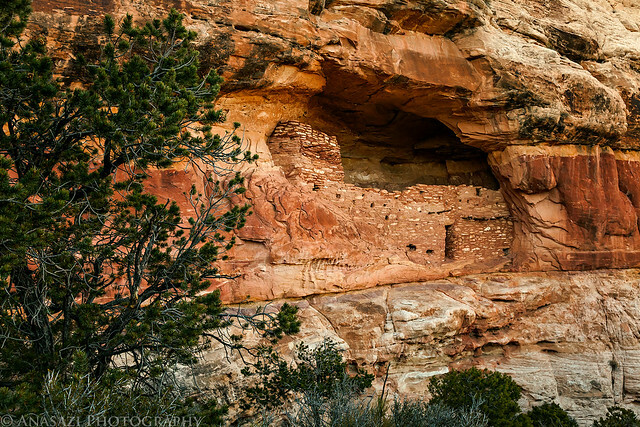 We also visited the impressive Beef Basin Wash cliff dwelling. 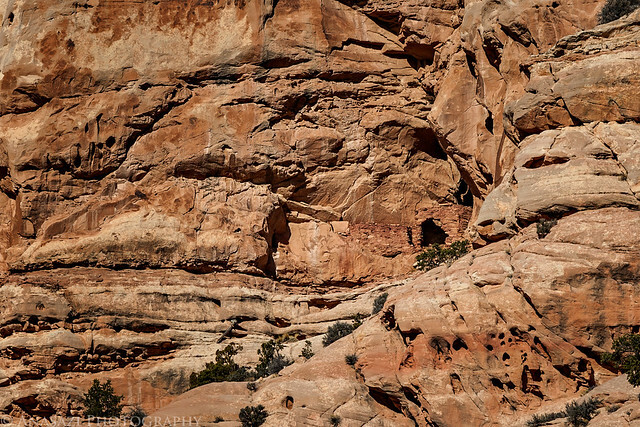 By the time we were done exploring the cliff dwelling it was time to head back to camp for some dinner. We met up with the rest of our group in camp and sat around the fire again until it was time to get some sleep. On Sunday morning I was planning on packing up camp and starting the drive back home. 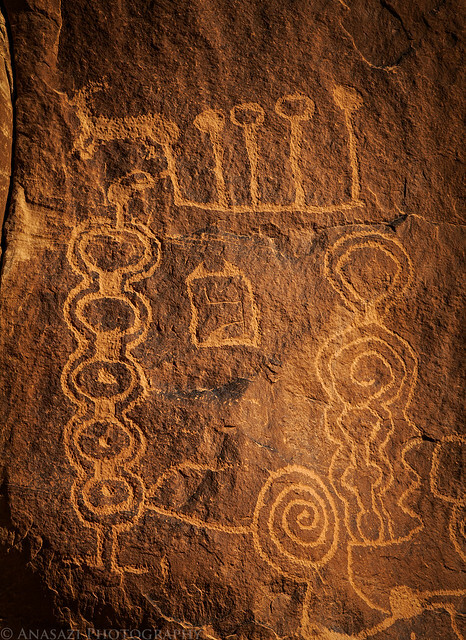 As Marty and I were driving through House Park on our way out of Beef Basin I had a quick thought about where that petroglyph panel I wanted to find might be hidden. I stopped my Jeep and turned around to search one last place before heading home. As luck would have it, my last minute hunch was right and I managed to find the impressive panel. I was very excited to find it and it felt great after being defeated the previous day. 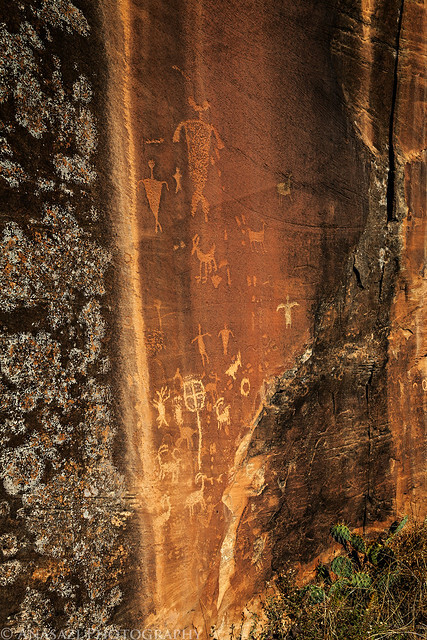 Not only is this an amazing petroglyph panel with designs and figures I have not seen anywhere else before, but it was also located high up in a pass through a notch in a cliff that offered commanding views of the entire Canyonlands region. 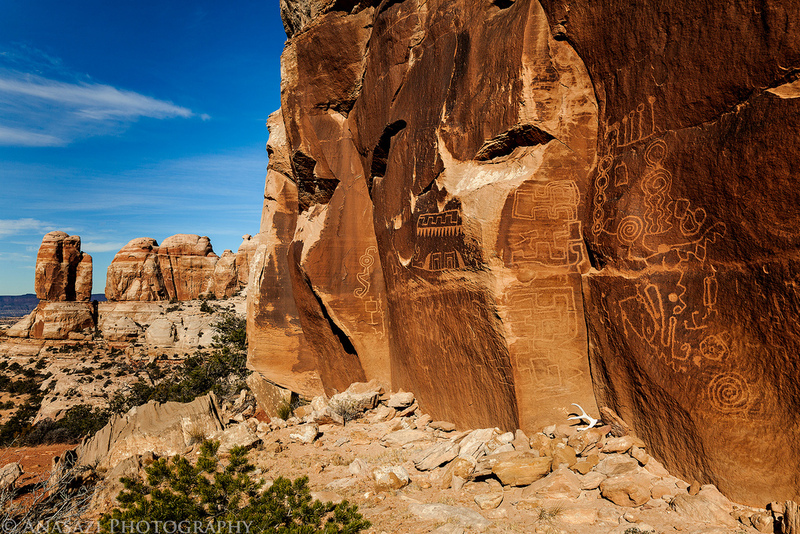 I could definitely see why this spot would be important and special to the creators of this rock art. Marty taking some photos of the panel. 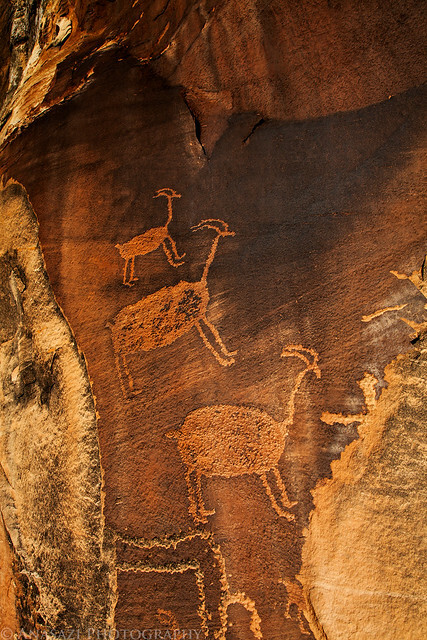 Here’s a few close up photos of some of the more interesting petroglyphs found at this site. After thoroughly exploring the area for more petroglyphs and taking plenty of photos, it was time to move on and drive back home. 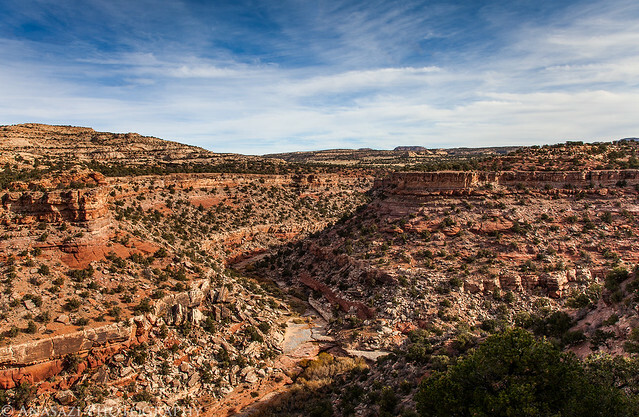 I stopped for a quick photo over Salt Creek Canyon as we drove by. 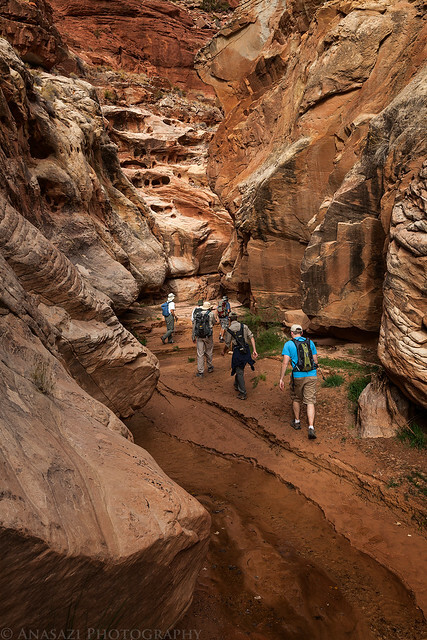 I’m hoping to backpack this canyon next year. 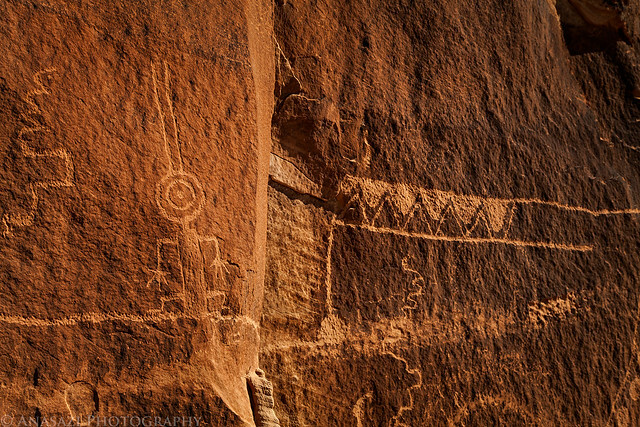 I swear I cannot drive through Indian Creek Canyon without spotting new rock art. I wasn’t even looking this time, yet this panel caught my eye as I drove by. I contemplated not stopping and to just keep going, but I had to pull over for a few photos. I’m glad I stopped because nearby I found this panel. I’ve been looking for this one for a while and it has always seemed to elude me. Not today! This line of nine sheep was also in the same area. 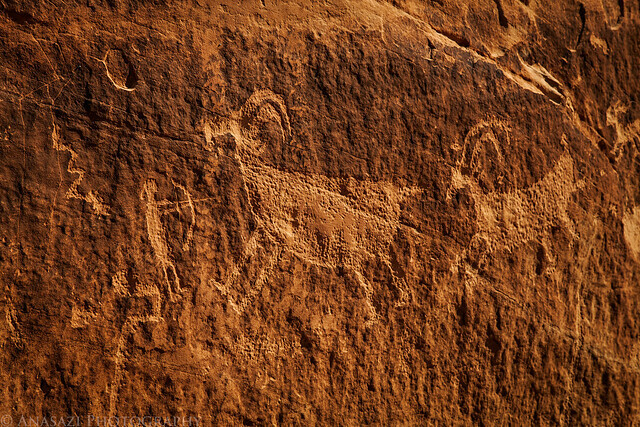 When I was done taking photos of these petroglyphs I hopped back in my Jeep and finished the drive back home. It was great seeing and exploring Beef Basin with some old friends that I haven’t seen in a while and some friends I see all the time. Sweaty palms looking at this!